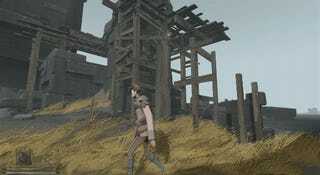 Ashen is an indie survivial RPG that we first showed off a few weeks ago. It's got some interesting ideas on stuff like passive multiplayer, but what really struck me was how striking the game's visuals were. So I got in touch with the devs so I could share more of the game's art. There are two main artists working on the game. One is 3D sculptor Leighton Milne, formerly of WETA and one of the co-founders of Ashen's development studio Aurora44. The other is Thomas Scholes, who has worked on Halo 4 and Guild Wars 2, one of my favourite artists and someone we featured here back in 2012. Below you'll see not only some of their work on the game, but under that their stuff from other projects (professional and personal) as well. You can see more of Leighton's work here, while you can see more of Thomas' work here.